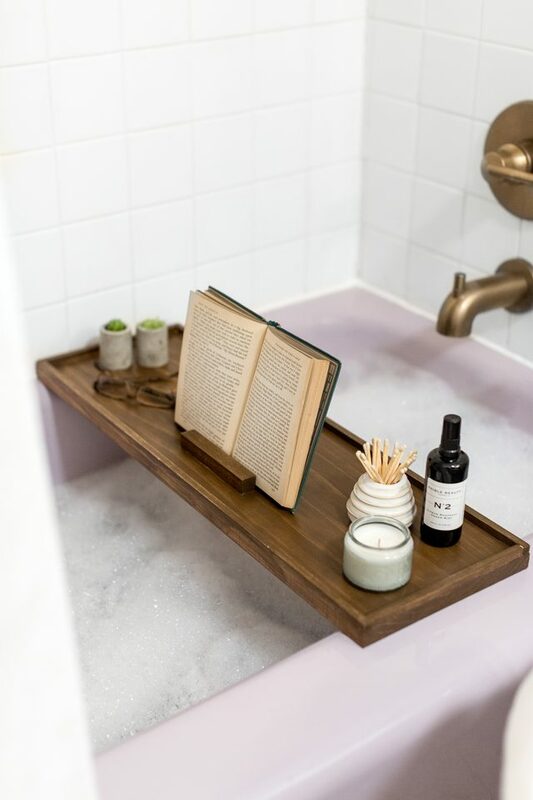 A bath caddy or tray is a necessary piece to make your bath luxurious and spa-like: put there your tablet, smartphone, reader, a book, a candle and a glass of wine to enjoy! If you love taking baths, it’s a must, and making one won’t take much time while turning your bathroom into a spa. 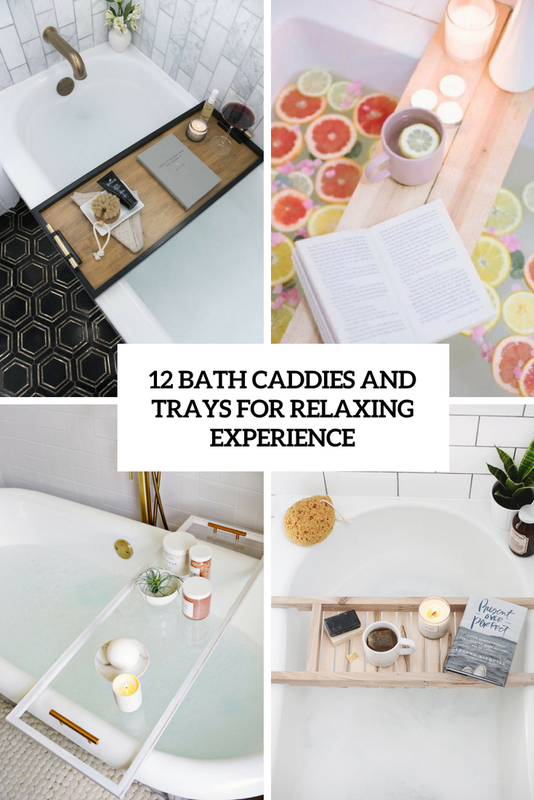 There are many ideas to make a bathroom caddy or tray to fit any bathroom style and look, most of them are made of wood but you may find some more ideas like lucite, for example. Here are some cool DIYs to try, go for any that you like. 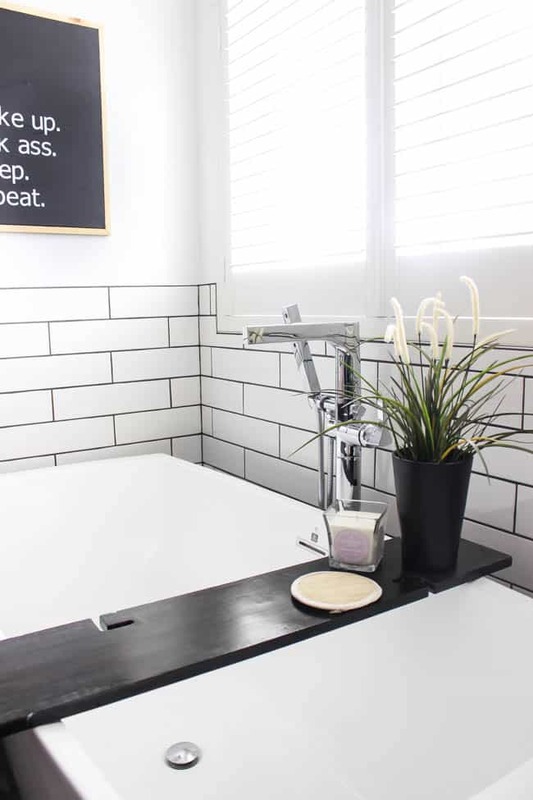 This minimalist bath caddy features a laconic look of black and light-colored plywood and brass hardware, it’s very laconic and chic and will easily fit a minimalist space or a masculine bathroom. It will accommodate everything you may want, read the tutorial and make the piece to add style to your bathroom. Clear lucite or acryl is a hot decor trend right now and it easily brings a modern feel to any space. Make a lucite caddy with brass handles to add style and chic plus a modern feel to your bathroom. Actually, you can match the handles to the bathroom fixtures to achieve a chic look. the project is very simple and can be easily realized if you have lucite at hand. Enjoy! 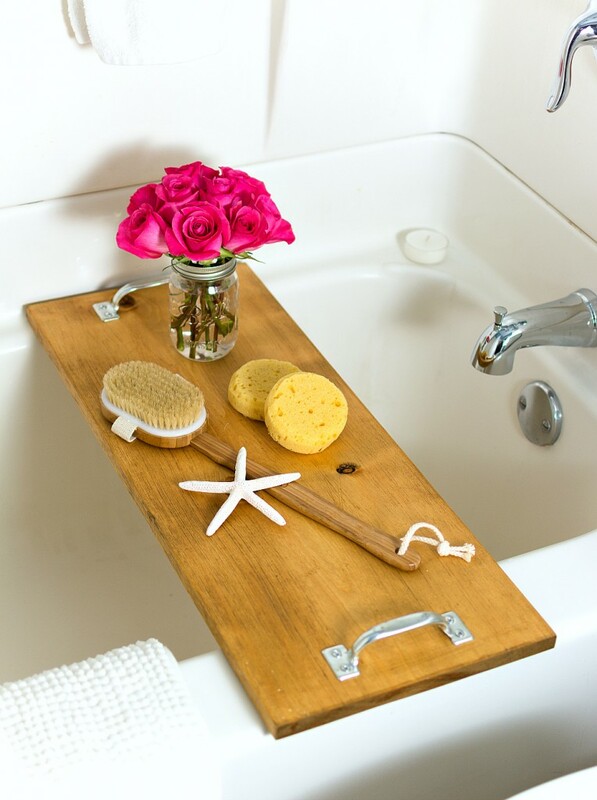 If your bathroom is rustic, make this cool rustic bath caddy to match. This piece is made of wood and stainless steel handles of a vintage look – the caddy looks very chic and spa-like! Stain the wood the way you like to match your bathroom furniture and accessories and make your bath experience luxurious placing here everything that you want. This vintage bath caddy is a chic piece to make – it’s sure to add vintage charm to your space. The piece is made of dark stained wood and brass handles. 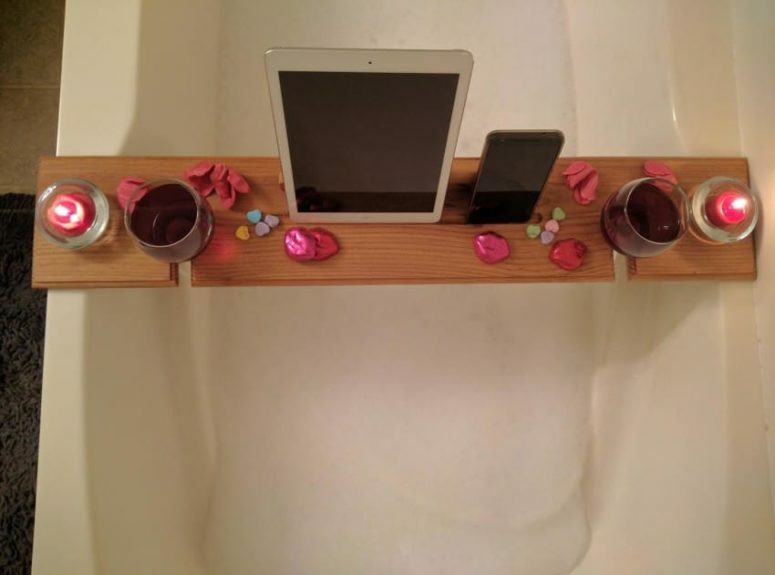 As no one wants their glass of wine to end up in the tub, so the author added some adhesive grippy bars for extra stability but you may skip this step if you aren’t going to put drinks on the caddy. This caddy looks very contemporary and spa-like as its bottom is made of planks – this wood shade of spalted maple and the bottom make it really relaxing. We strongly recommend you to look for this type of wood to make the item more interesting. The item has very comfy legs that stay stable on your bathtub edges, and don’t stain it dark. Get inspired and enjoy your bathing experience! 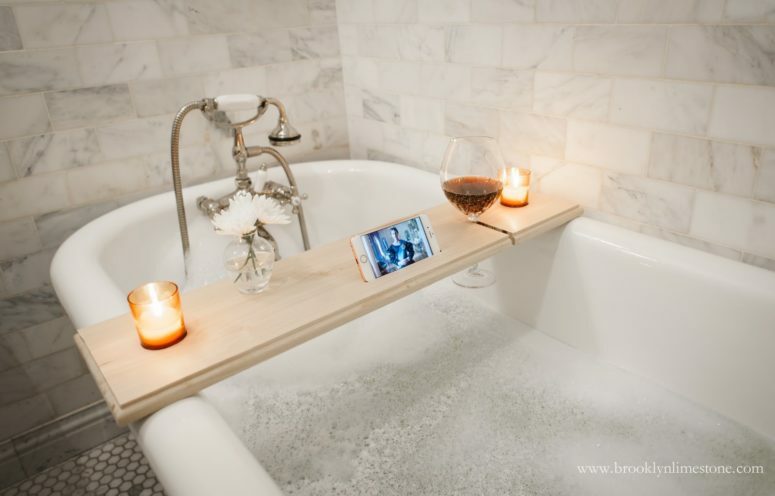 This is not only a bath tray – it’s a wine holder! Moreover, the piece may hold two glasses – for different wine or for a shred bath experience. Staining the bath tray gives it a gorgeous finished look, making the wood grain more prominent and giving it a beautiful color. You could stain this according to your preference, depending on what color you want. Staining the wood also makes it less permeable to water, which is great since this will be used over a bathtub. 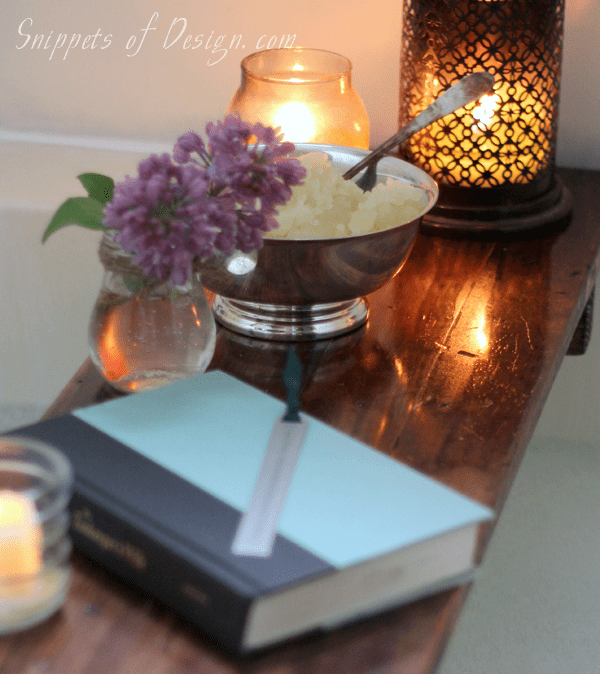 This super easy bath tray can be made in just a couple of minutes – if you going for a bath and want a caddy, this is your choice! The tray is made of wooden planks and glue plus a glue gun – nothing else! 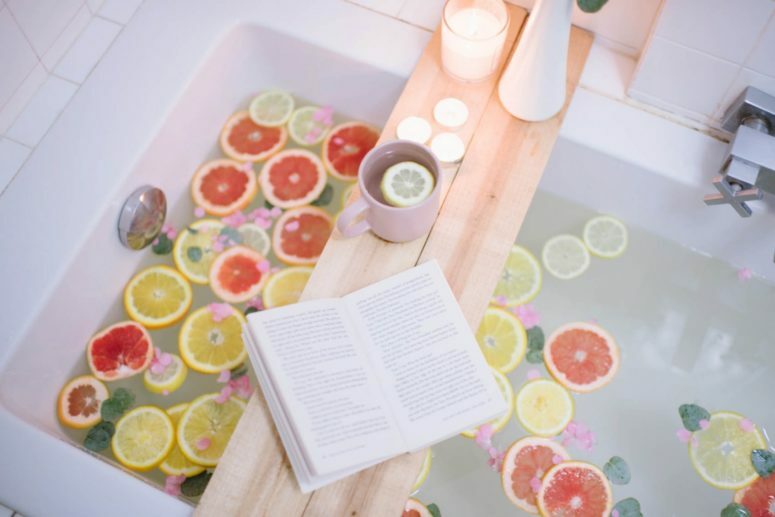 Quickly make the tray and go take a bath with candles and a book plus some tea! 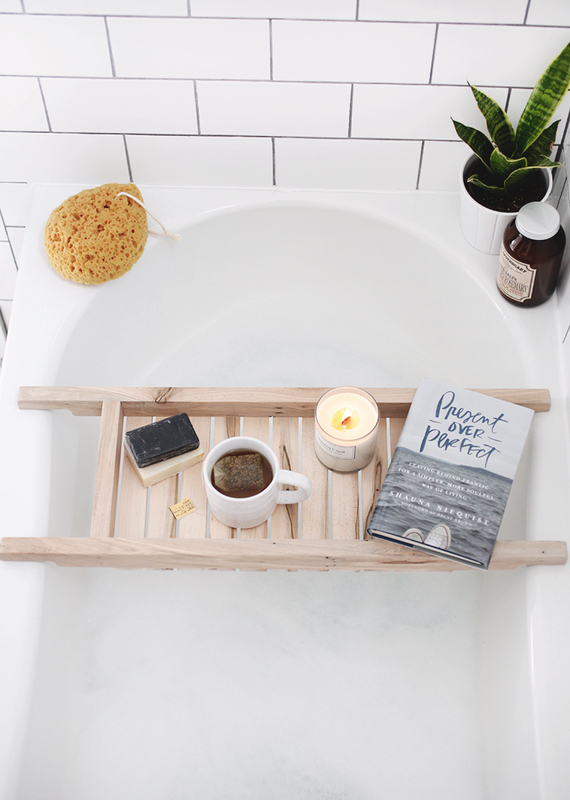 This vintage-inspired wooden tray for your bathtub is made of wood planks and little slabs to make the edges for a more chic look. The piece also features a book holder, which can be used for a tablet, a phone, an e-reader or any other piece or just skip the step. Stain it dark for a vintage look or keep it light-colored for a fresh look. This light-colored pinewood tray is a simple and stylish modern piece, which can be ideal for a Scandinavian or a contemporary bathroom. It’s built in two rows of wood to make the caddy more stable on the edges of the bathtub. The piece is left unstained to make the project fast and to keep it modern and fresh. 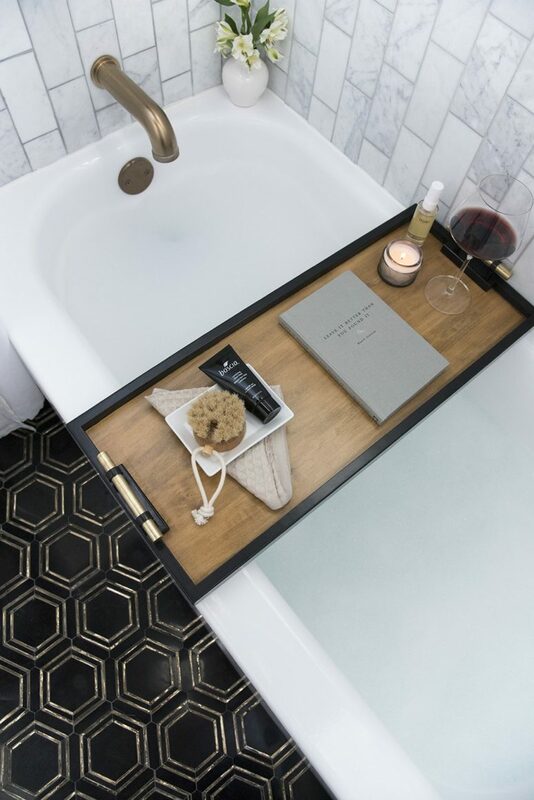 This black wooden tray holds up to two wine glasses and will bring a relaxing feel to your bath with delicious wine you’ll have at hand. The item is made of pinewood and is painted black, it will add a bold touch to your neutral space or will fit your dark-colored bathroom perfectly. 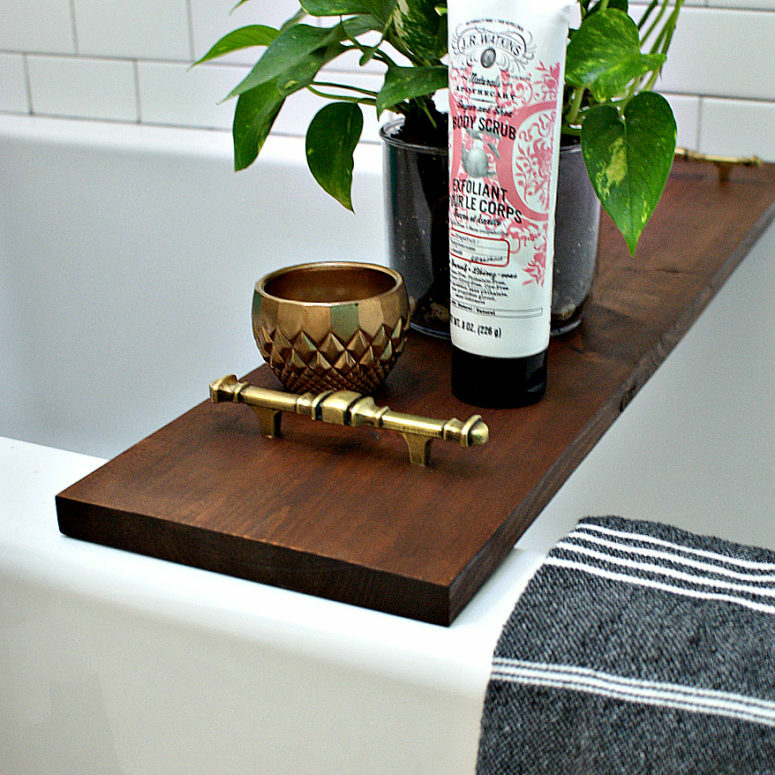 DIY the bath caddy of your dreams using a piece of scrapwood using this easy tutorial. This DIY homemade gift (which is perfectly acceptable to make for yourself!) is for all the lovebirds who just want a few minutes alone in the bathtub with their favorite tv show and beverage. This is ‘Netflix And Chill’ for grownups, it’s perfect! Make this elegant bathroom tray and add dark staining to it – it will be a chic accessory for your relaxing baths! 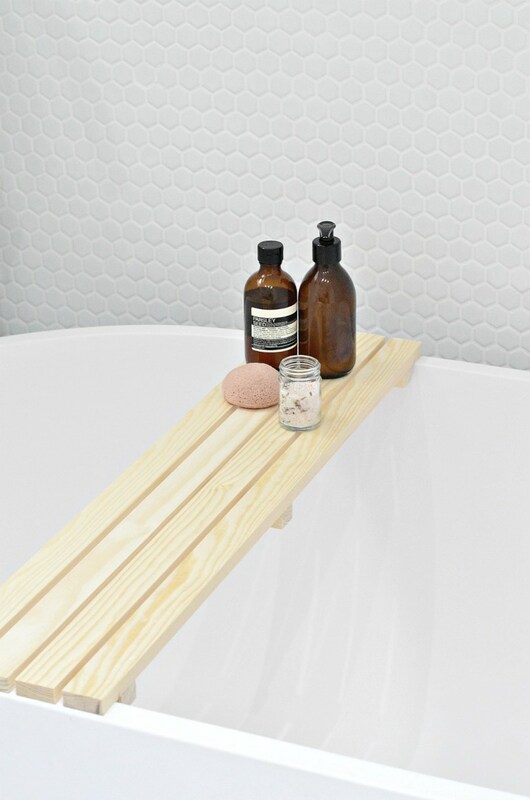 Show off all the wood imperfections if any, they gonna add a refined touch to your bath caddy. Read the tutorial to find out how to do that right and enjoy the result!